With a Camp lifestyle atmosphere, our new "houndquarters" aims to accommodate both our employees and their furry friends. Camp Bo w Wow, the nation's largest Doggy Day Care and Boarding franchise, relocated its headquarters to Westminster, Colorado, to occupy a new 8,289-square-foot space conceived with dog friendliness in mind. The 100+ million-dollar brand, which ranked #1 in the pet category on the Entrepreneur Franchise 500 list for 2016 and 2017, has already displayed significant growth this year with an 18 percent increase in its corporate workforce, and has additional plans to increase its team by 8-12 percent by year's end. Throughout Camp Bow Wow's expansion, the franchise remains committed to its dog-driven core values and encourages its corporate employees to bring their dogs to work regularly & even into meetings. From stress relief for staff to increased socialization for their dogs, the reasons to bring furry friends into the office are numerous. 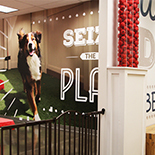 Camp Bow Wow's new office reflects the brand's unceasing capacity to lead the doggy day care and boarding sector both in profitability and by example in the workplace. The franchisor made careful interior design and floor plan decisions in order to recreate the Camp lifestyle at its headquarters, benefiting both pets and their working pet parents. The space's intentionally long hallways are great places for employees to play fetch with their pups, while a gated area in the back of the building gives dogs a chance to socialize and enjoy treats from complimentary dog treat dispensers. Private office doorways and cubicle "pod" entrances are also affixed with dog gates for staff who want to keep their canines close by, while toys, water bowls and dog beds are aplenty around the office. "Our pet-friendly workplace policy is reflective of the fact that everyone who works at Camp Bow Wow is genuinely passionate about dogs," said Christina Russell, president of Camp Bow Wow. "Many of our employees are also frequent foster pet parents, and we are delighted to support their commitment to animal well-being by providing a positive environment for these foster pups while they wait to find their forever homes." The executive leaders at Camp Bow Wow can attest to the numerous studies and articles that find that allowing dogs in the office increases staff morale, productivity and overall happiness. Additionally, pet presence can help lower employee absenteeism rates, reduce stress and strengthen relationships between coworkers. In order to further maximize the benefits of allowing dogs at work, Camp Bow Wow's new headquarters offers empty offices and collaborative rooms that are available for staff who need quiet spaces on busy days. Camp Bow Wow's ability to create and maintain a dog-friendly environment as its staff, office space and revenue continue to grow is a testament to its position as "leader of the pack" atop the pet care industry. Through deliberate design methods and careful execution of pet-friendly office practices, the franchisor demonstrates its vision of "Happy Healthy Pets, Happy Healthy People" at its new Westminster, Colorado headquarters.